So, we have definitely entered the "Where are your baby's shoes?" phase of parenting. You, see it's not that Jake doesn't have shoes....it's just that his mother doesn't know how to put them on. Every time I try he refuses to unfurl his toes and the whole thing is just impossible. Every couple of days, we find ourselves in a Cinderella's-stepsisters-type dance when I determine to get some shoesies on his feetsies. He has now outgrown several pairs that never fit??? When do they teach you how to put shoes on a baby? Did I miss that in my birthing class? Is it in one of the baby books that I haven't read? Maybe it's not my fault at all...and my baby's just...deformed? I invite any feedback regarding the shoeing of a baby. And for that matter, I invite any feedback regarding the sock-ing of a baby. Because this is the end of a good day. And I love it...despite how disturbing that may sound. I was first introduced to the idea by my husband. We were dating in college...and talking about diapers? I'm not sure how the topic came up, but it did; he told me he'd been cloth diapered as a baby, and I was totally repulsed by the idea. I associated cloth diapers with the one person that I was aware of who used them when I was growing up. Her kids were always messy and running in her front yard in coverless cloth diapers, haphazardly pinned and dragging in the dirt. Now. This certainly wasn't the situation in Jacob's family. No. They were probably naked. Yes. We cloth diaper. And it really isn't a big deal. At all. The hardest part about it was just plum choosing what kinds of diapers to use because for the longest time it was completely incomprehensible to me since the cloth diapering systems out there are as numerous as the sand on the seashore or the stars in the sky (and I choose my biblical metaphors very deliberately...because after all...Jesus was cloth diapered) . We use (for you CD moms out there) the occasional BumGenius or Rumparooz pocket diaper for outings and babysitters, but we mostly just use prefolds. I lay the thing very unceremoniously into a cover and snap it on and they've never once leaked. Jake has leaked out of his fancier pocket diapers lots of times, but the prefolds have been awesome. Diapers overhead. 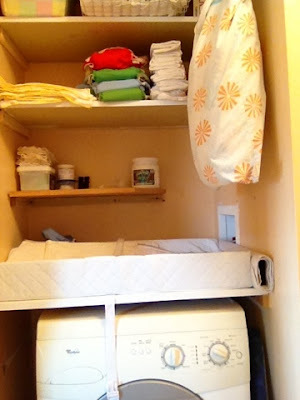 Changing station on top of washing machine. Bag of dirty diapers hung on wall. When we're on the go we have a small wet bag that lives in the diaper bag. We even use cloth wipes! Which I 100% prefer because they're so much more substantial than disposable wipes and you just throw them right in with your dirty diapers. 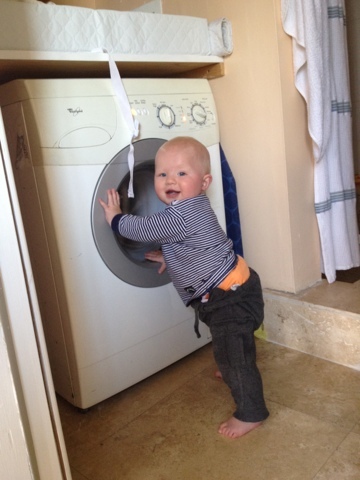 Dump diapers in washing machine and press buttons till them dipes are clean. We don't have a drier, and we DO have lots of sunshine, so it's a must for us. But necessity aside, this is still the best part. You know how folding clothes is awful, but folding towels is kinda fun? The methodical folding of a uniform shape. You know? Now that Jake's big enough I set him down in the grass. He eats dirt. 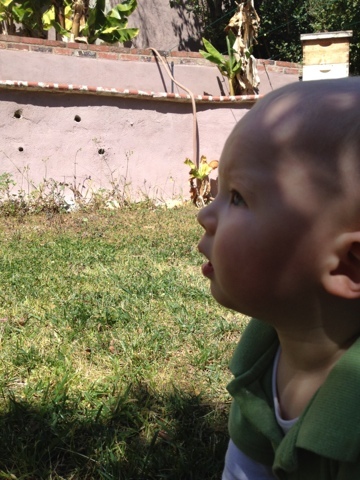 We watch the bees. The sun bleaches away the poop stains. It's all just lovely. But don't take my advice on this subject. I'm serious. DO NOT MISTAKE THIS FOR A RECOMMENDATION TO START CLOTH DIAPERING. Why? Because of this: EVERY non-Catholic friend who's started using NFP because they talked to me about it has ended up accidentally preggers just a couple months in. Every. Single. One. You may think that seems totally unrelated, but if you start cloth diapering because "Kate does it, and she says it's no big deal, and it works great for them" -- I will be the one who has to look your husband in the eye and smile like I don't know what he's thinking once your cloth diapering has gone south and your entire house smells like a dead animal. Happy Friday and go see Jen for more Quick Takes! Bad night after bad night after bad night....sweet...heart. So here I go. Getting real. Needing some catharsis or something. For those of you who don't want to read about Baby Jake's sleeping habits, I've posted pictures for you that are otherwise completely unrelated to the text. Enjoy them. For the first few months of Jake's life he only woke up a few times at night. Maybe 2-3 times a night. He would nurse, I would put him back in his bassinet or I wouldn't and the family would ease back into a peaceful slumber. I was never exhausted during the day. I never felt sleep deprived. I was so encouraged by the apparently good sleeper I had birthed. Wakes one or two more times to nurse. 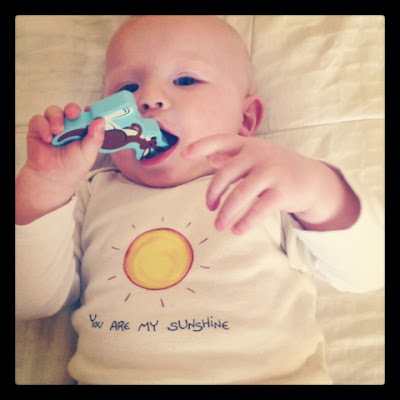 But that was four months ago, and it has become VERY apparent just how bad of a sleeper baby is, solid foods be darned. 7:45pm Jake goes down in his crib. 10:13 Wakes up and nurses - 10:30 Back down in his crib. 12:19 Wakes up, nurses, stays in our bed. 4:15 Falls back to sleep. Reality check, Mama Rhodes. I've been avoiding making a record of how much he slept because the record would you know...make it real. Because otherwise maybe it was just all a dream. I don't think I'm tired...but then again maybe I just don't know what it feels like to have slept enough. Alleged non-sleepiness aside, on about mid afternoon I start to fear the nighttime. My mother was really deliberate to get her babies to sleep through the night from very little. She did the whole let them cry a little then go in and comfort, put the pacifier back in, let them cry a little longer next time, before you go in, comfort, put the pacifier back in...That's an idea...a pacifier...how do you get a 10 month old to start taking a pacifier? Have we missed it AND the cry it out train? Getting her babies to sleep was pretty necessary for my mother since until her third kid she was working full time at the clinic, was on call, and was delivering babies at the hospital, so sleep was hard enough to come by. When I told her about my sleeping woes she said, "I've had patients like you." Thanks for the empathy, mother dear. For the good of everyone in the family - Mama, Papa, and baby - we have begun some sleep training. I hope and pray we'll have good news to share with you soon. Now isn't that just what you wanted to read about this Thursday afternoon? Perhaps I shall rename the blog: The Riveting Rhodes Sleep Log. What say you? In my frustration at not being able to share in the post Hunger Games viewing glow, I have decided to highlight our own saga this weekend. 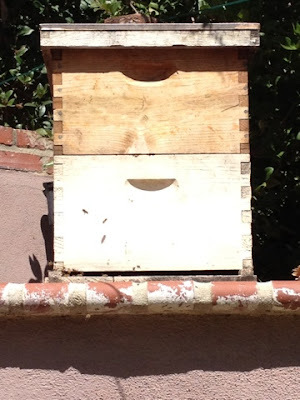 The bees are back. The war was really short lived, and it looks like our little friends are here for good. There's something very appropriate about it I suppose. 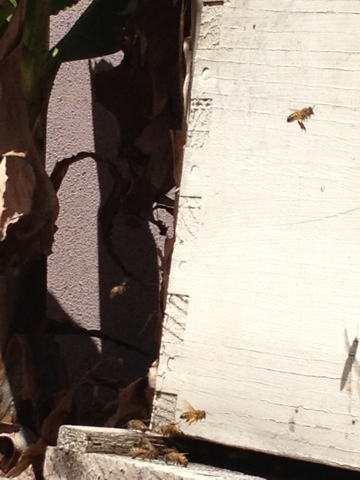 We lost our last swarm a couple of months before we had to move and our little house was razed to the ground. Now that we've committed to LA at least for a while longer, the bees have recommitted to us. They're honestly lovely creatures. They spear out of the hive light as day on their runs, and then they return all wobbly when their legs are laden with pollen. Jake and I go watch them everyday. Preferably in the heat of the day when they're super active. This probably isn't wise since as far as I know we are both deathly allergic...I've never been stung. And (knock on wood) neither has he. Jake isn't as interested in them as I am. He's much more into dirt and sprinkler heads. Anyhow. There are some buzzings for you. Hopefully my next segment in the saga will involve honey! Most of you know this story, but I will tell it nonetheless for the five people who read this blog and don't know it. Jacob came home from work in March of last year to tell me that he'd lost his job. He hated his job, and had been looking for a new one for several months, but that didn't change the fact that I was 8 months pregnant. This is really a happy story, but I can't help but be sad when I remember that day. The day that the man I love had to come home and tell his pregnant wife that he'd lost his job. We tried to be our best selves, but it was hard. To keep me insured we opted to have me stay on Jacob's employee health plan with COBRA until after the baby was born, which set us back 900$/mo (and was a complete administrative fiasco that still haunts us.) I was four weeks from finishing my master's degree which meant term papers and comprehensive exams and bookoos of grading for the courses I was teaching. The property we lived on sold after being on the market for 48 hours, which meant we had a month to move. We eeked out a living on savings and unemployment benefits. Jacob managed to get several months worth of work on television sets, and I started teaching again in the fall. We had an outpouring of support from friends and family. It was humbling - in the most beautiful way - to need and receive so much help. A couple months ago things started getting very real. Despite dozens of interviews, there was still no job, and we thought our time to leave LA might be nearing. Ever since we'd visited Jacob's Mennonite relatives in Kentucky, we'd been suffering from a farming fever. We began to think about moving to Washington state to join Uncle Michael who's making a go with some soil up there. Our expenses would be minimal, our electricity would be solar, and our eggs would be homegrown. We thought and thought and talked and talked for months. I teach until the end of April, and so we were committed to LA at least until then. Also, Jacob had interviewed in November for a position at Alcon Entertainment that he really wanted, and we still hadn't heard back about it. Two Mondays ago Jacob went in for an interview at a company and came home that night with a job offer. We were pretty stoked. It was a temp to hire position at a studio that is in total HR turmoil, but it was a job. We went out for sushi, drank large Sapporo's, and felt generally good about life. The euphoria carried us through that week even as the company continued to push his start date from Wednesday to Friday to the following Monday and was otherwise shadily silent. On Friday afternoon, Jacob got a call from an unknown number. He answered it to find himself on the phone with someone in the HR department at his would be employer; she informed him that they'd given the job to someone else. The baby was napping, and we were sitting on our patio. I started to cry. I was angry at how he'd been treated; I was angry that there was no hint of an apology; and I was angry that I'd spent the week recommitting my heart to our life in LA only to be catapulted back into flux. Jacob saw my tears and right then and there we decided to move to Washington. Jacob said he wouldn't take any more interviews and he would stop sending out resumes. We'd start our preparation and move at the beginning of May. Within five minutes, we were on the phone with Uncle Michael informing him that we were gonna come crash his farming party. While on the phone with Michael, Jacob got another call. It was Alcon, who he'd been waiting to hear from since November, and they wanted him to start Monday. So we decided to stay in the land of botox, beaches, and blockbusters, at least for now. Perhaps someday I'll re-mint this blog The Rhodes Loggers and finally put my new bonnet to some good use, but until then it's more sunshine for us. Friday marked the end of the first week of the new job. We've finally become less afraid to speak the fact out loud. Jacob laughingly compared himself to an abused dog - skiddish and not sure whether to trust these nice people - I didn't think it was a very pretty comparison, but it was probably an apt one. The day after Jacob lost his job last year, we went to a St. Patrick's day party hosted by Jacob's Knights of Columbus chapter. We sat with a man who was all alone at a table. 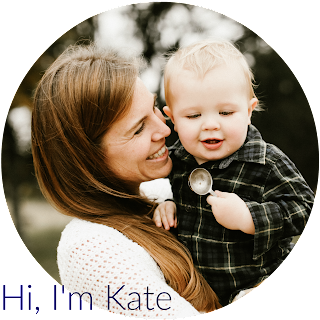 He was a bit of a talker, and upon my seeing my pregnant self began telling us the story surrounding the birth of his first child. You see, he'd lost his job when his wife was 8 month's pregnant... She is now dead and his children grown, and he spoke about how unemployment had enabled him to be home for the first months of his baby's life. He remembered it fondly, even gratefully. 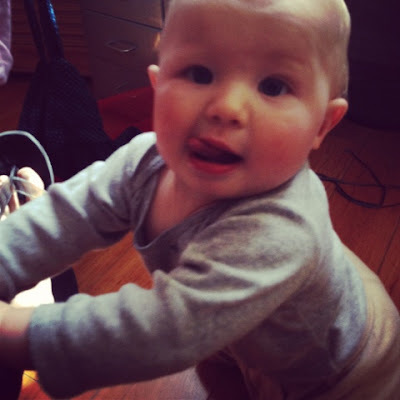 He told us the story with an edge of warning in his voice: slow down, love this baby. I will end the story there, because there really isn't a better ending than that - and truth is, that's been the end of this story for a long time. A video for your Saturday morning. Jake on the Move from therhodeslog on Vimeo. Well, Grace has tagged me in this blog chain, and I don't think I'm very good at these types of things, but I decided I should do it because of all the postcards I never sent back when I used to get that chain mail thing. Does anyone remember that? Was that even real? Maybe I dreamt it. 1. The first rule is to post these rules. 1. I should be grading papers. If school is in session, this is true about me. I always should be grading, but instead I'm usually online, procrastinating and feeling sorry for myself. 2. My husband and my son are both Jacobs. We call the big one "Jacob" and the little one "Jake." This seemed like it would work back when we were picking baby names and couldn't agree on ANYTHING. But if the Papa Jacob/Baby Jake distinction confuses you, you're not alone, I clarify this (or guiltily don't clarify it) about 28 times a week. 3. I am way messier than my husband. WAY. I cannot get dressed or undressed without leaving a trail of half clean clothing lying on the floor. I start craft projects and leave them half done all over the middle of the living room. 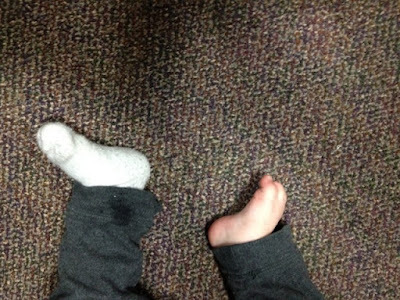 If I knock something over or spill something or open something in the morning, I frequently don't right the situation till the evening of the next day....and Jacob...well Jacob folds his socks. 4. I like writing this blog. I don't write more often because blogging is a guilty pleasure, and I'm Catholic which means I'm big into mortification. Actually, I'm a Catholic convert which means I'm extra big into it. 5. I like coffee, but I rarely drink it. Why? See #4 plus headaches. 6. I'm very good at math and standardized tests, but instead of embracing this, I've ignored it and spent most of my life trying to culture my *artistic* and *imaginative* sides. 8. Baby Jake and I are about to go to visit my old babysitter who is in LA today. She watched me all my growing years and for most of that time spoke very little English since she's from Guatemala. Until I was in high school I would dream in Spanish...only I never knew what anyone was saying. 10. I like to run. I think of myself as a runner. I ran cross country in college. I started running one spring when I realized how bad I was at tennis (very bad). But the thing is, I'm not very good at running. I'm slow (very slow) and injury laden. 12. Nope only eleven, you sillies. Not old enough to be married and have a kid in West LA or 27. Tricky. I'd be lying if I didn't say Grace who sucked me in during the early days of her blogging because she was Pregnant with Thyroid Cancer!!!! and now I'm mercilessly hooked and visit the Camp everyday. Recently, I'm also loving me some Kitchen Stewardship. The pizza our old neighbor used to make us. Homemade pizza crust. Instead of a marinara, mix together some ketchup and balsamic vinegar for the sauce. Layer the top with caramelized onions, globs of fresh mozzarella and goat cheese, fresh basil and rosemary. And bake it hot. I'm tempted to say something of the magical realist bent (Rushdie, Marquez, or Allende) but will go with the less pretentious gem by Betty Smith about little Francie Nolan. 6. one piece or two piece swimsuit? The first time I ever wore a two piece swimsuit was my senior year of college (a bit of a late bloomer). I wore it on a party boat, and the plastic clip that fastened the top piece literally broke while I was sitting and talking to some girls in one piece suits about modesty. You see. There is a God, and he plays practical jokes. 8. pet(s)? if yes, name(s)? Yes. 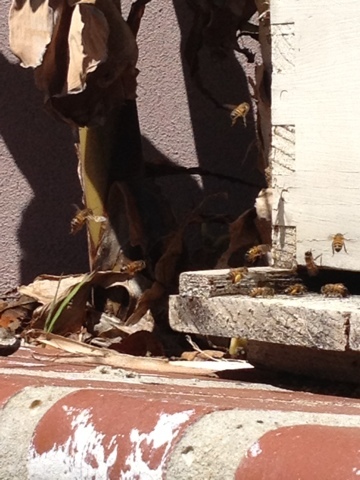 We have in the neighborhood of several hundred honey bees. They don't have names, but Jacob calls them his "sweet b****es." 9. specific makeup item you couldn't live without? This is the point in the conversation where I start squirming because I have terrible habits in this department, and I get bunches of tsk tsk tsks from sales reps whenever I try to resupply my concealer or something. 10. favorite song of the moment? Of the moment and forever: Roseville Fair as sung by my buddy JT on the day I got hitched. Offering up some beers on St. Patty's and making chicken stock. 1. Best day you can remember? 2. Favorite item of clothing and why? 3. If you could meet any fictional character, who would you choose? 6. If you could throw any kind of party, what would it be like and what would it be for? 7. Favorite Season and why? 8. If you won the lottery, what is the first thing you would do? 9. What is something you learned in the last week? 10. Best meal you've ever eaten? 11. If you had to change your first name, what would you change it to? A. Because I prepared a lovely salmon dinner for my husband. B. Because my son was sucking on a fish oil capsule while I was Pinteresting. I nursed him to sleep on our bed, and I didn't want to move him to his crib because I didn't want to wake him. I did tuck some pillows around him and stupidly deemed them impediments enough to contain the little mover before he went exploring. An hour later, I dutifully jumped up from my internet surfing at baby's first chortle, but as I was trotting to the bedroom I heard the thump. He was in my arms before the crying began. That awful crying with the long gaps in between the wails. 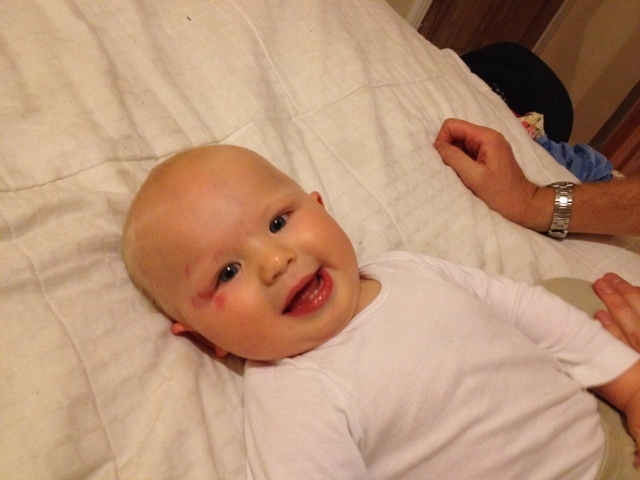 Thankfully the crying didn't last long, and he was quickly pushing and kicking against my chest to be let down again. That's when I saw it. Baby's first raspberry. The picture doesn't do it justice...but that's not the point...the point is that my first (FIRST!) thought was about the bridal shower we were attending later that day and how my delinquency would be on display for all the pretty ladies. If only things like this were one time occurrences. On Friday I let him play with my drinking glass...and then it shattered in his lap. 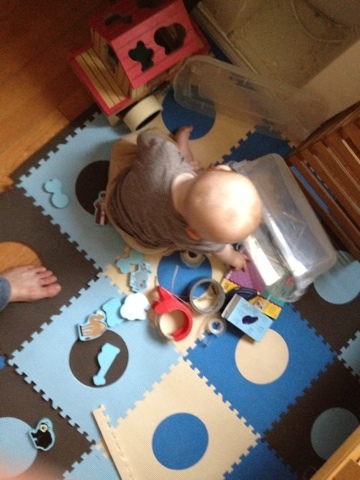 Yesterday he pulled out the container where we store all our various tape and adhesives. After letting him empty about half of its contents I remembered that the packing tape had those metal teeth on it. Upon going over to retrieve it, I saw that the box also had an exacto knife, ripe and ready for the cutting, AND a razor blade. I have to go. Sorry to end so abruptly...I let Jake play with his favorite toy - the dustpan - in his favorite room - the bathroom - and I'm pretty sure he's currently licking the base of the toilet.